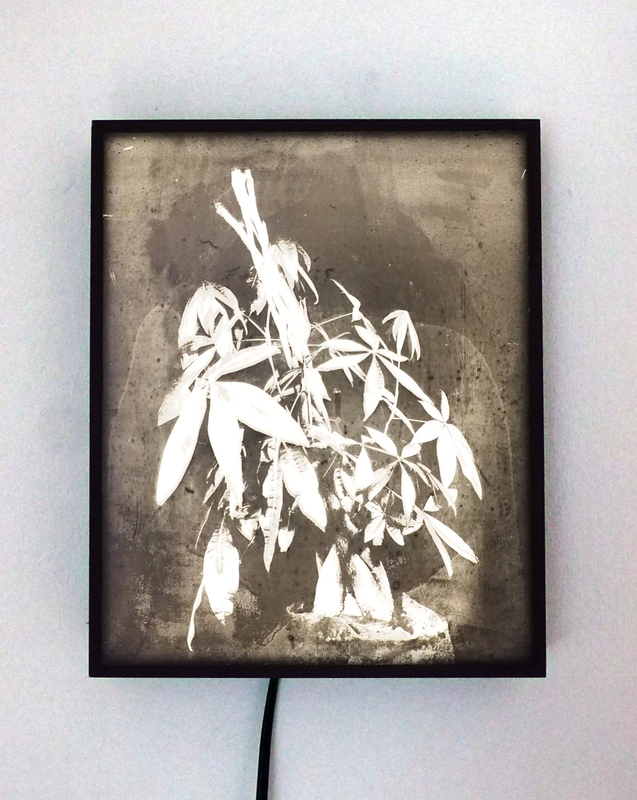 Dutch duo Jaya Pelupessy (1989) & Felix van Dam (1986) developed a new technique with a camera that combines photography with silkscreen printing. They built a makeshift camera, with a silkscreen inside, to which they applied a light-sensitive emulsion. The artists reflect on how objects are translated by the camera, presenting them like archaeological findings. Simultaneously, the artwork reconsiders the original bearer of photography by investigating different ways of presentation. New work of Pelupessy and Van Dam is part of the Back to the Future exhibition in Foam, that is on display until March 28th of 2018. This very special lightbox was part of an earlier exhibition - Traces of the Familiar - in Foam 3h in 2016. It illustrated the quest Pelupessy and Van Dam embarked upon to trace known techniques and revisit the origins of photography in order to arrive at new possibilities for the medium. The artists regard the steps in their explorations as equally important to the final product. Thus emphasis lies on the process of construction, where the suggestion of a narrative begins. This suggestion is not only conveyed in the stylistic images of tools utilized for the technique, but also in the final prints that unveil their structure in layers. It can be placed on a table or shelf but its preferred location is on the wall. Jaya Pelupessy (b. 1989, the Netherlands) graduated from the Hogeschool voor de Kunsten Utrecht (HKU) in 2013. During his studies he had an internship with Taiyo Onorato and Nico Krebs in Berlin. In 2015 he received a grant for Young Talent from the Mondriaan Fund. He is one of the founders of Mt. Figure, a platform/collective that functions both as curator and publisher. Felix van Dam (b. 1986, the Netherlands) is a graphic designer who also studied at the HKU. He graduated in 2014. Because of the production process it can take up to three weeks before the work can be shipped. We will keep you informed in the mean time. The work will be carefully wrapped and then shipped as an insured package. You will receive an e-mail with a Track & Trace code when the package is on its way. A copy is on display at Foam Editions, the gallery on the third floor of Foam Fotografiemuseum. If you have any questions about buying this work, please contact the Foam Editions team.